The public relations efforts set into action by the Riviera Nayarit in Brazil have directly and indirectly generated exposure in that country’s media. 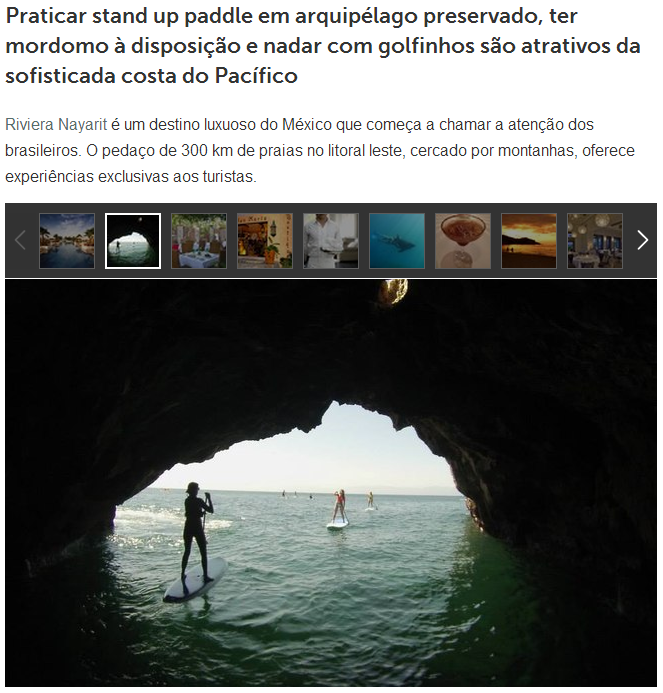 The Riviera Nayarit Convention and Visitors Bureau’s public relations efforts have had the proverbial snowball effect by generating excellent direct or indirect exposure in Brazilian publications. Some of the most recent articles about the Riviera Nayarit in the Brazilian media have been a result of the FAM trips, which not only guarantee publication in the media those visitors represent, but also motivate other media to write about Mexico’s Pacific Treasure. Proof positive can be found in the case of Luciana Franca, writer for Luxo magazine, who visited the destination as a guest of the CVB. Then there’s Karina Oliani, hostess from the TV station OFF, part of Rede Globo, who had never visited the destination. Both published excellent articles on the Riviera Nayarit. Karina Oliana, considered an opinion leader in travel matters, promoted the destination on her TV show, on her personal social media accounts and on her website. Rede Globo has a daily audience in Brazil of more than 185 viewers per day. It’s considered the second largest media conglomerate in the world and the largest of its kind in Latin America. Karina, who is also a doctor, announced the Riviera Nayarit will be the next destination she’ll visit, which surely means she will once again publish more about our destination’s bounty. These are the tangible results of the synergy that takes place with the public relations, the promotions and the marketing efforts directed towards Brazil.